How do we explain Dog Prom? Hmm well think about your high school prom but instead of going with your cousin or a pity date, you're going with your best friend. Man's best friend. 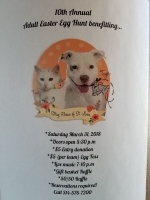 On April 14th, skip the staircase photos and the ridiculous corsages (or don't) dress up your dog and come party with the other area furrry friends, all while supporting STRAY RESCUE OF ST. LOUIS and Bi State Pet Food Pantry. 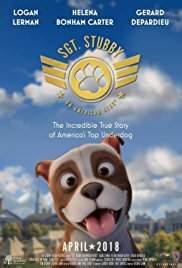 Sgt Stubby: An American Hero Opening Day! Stray Rescue of St. Louis has partnered with Fun Academy Motion Pictures for their upcoming film "Sgt. Stubby: An American Hero"
Stray Rescue of St. Louis will receive a percentage of opening night earnings for the state of Missouri! So make plans with the whole family to see this heartwarming movie on FRIDAY APRIL 13th and support Stray Rescue's animals in need. Here are the theaters in MO playing Stubby on April 13th! Join Team Running Buddies and run for homeless animals in the GO! St. Louis Marathon & Family Fitness Weekend! On behalf of all homeless pets waiting for their second chance at a life filled with warmth and comfort, thank you for joining Team Running Buddies for the 2018 GO! St. Louis Marathon and Family Fitness Weekend! By running or walking on behalf of Stray Rescue, you will highlight the importance of shelter enrichment and raise funds for training and behavior programs. As an essential part of the team, you are committing to raising $500 (or $250 for 5k participants) by asking family, friends, and coworkers to help our cause. 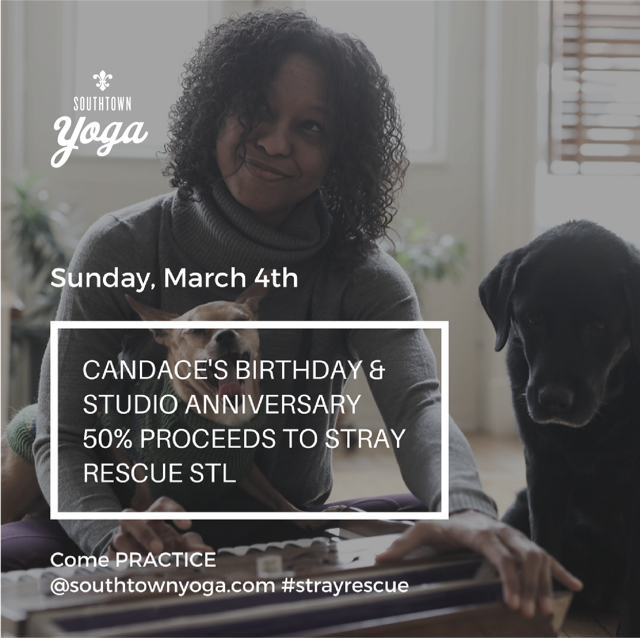 In return for your dedication, Stray Rescue will pay your entry fee and provide an official team t-shirt, training assistance, group runs and rallies, an army of compassionate supporters to urge you on, and more if you register before March 1st! And remember, you may choose from various race distances when you register! To register under Team Running Buddies, please complete the committment form. 10th Annual Adult Easter Egg Hunt benefiting Stray Rescue of St. Louis at Creve Coeur Lakehouse. Gift Basket Raffle, 50/50 Raffle and More! Reservations are required, so please call 314-576-7200 to make reservations today! Live Life In Full Bloom! March 23rd-25th 2018! Held at The Belle-Clair Fairgrounds. 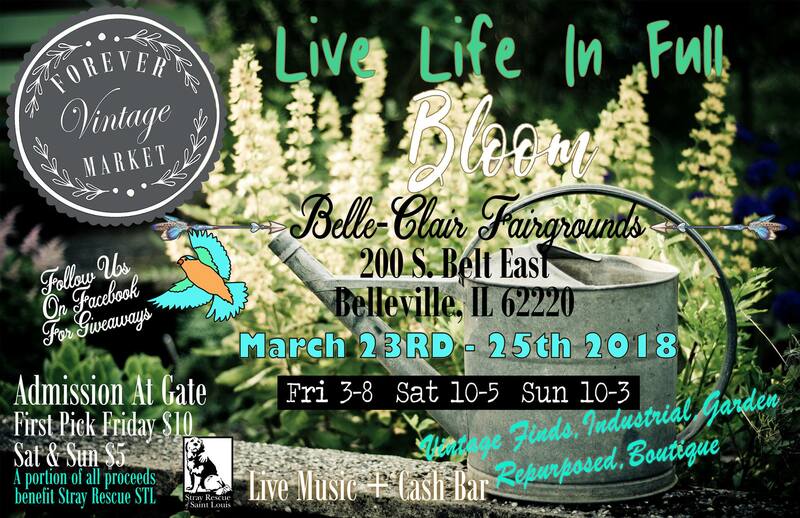 A Weekend of Shopping for Vintage Finds, Industrial, Garden, Repurposed, Boutique, Jewelry, Gourmet Foods & More! Live Music, Brand New Restaurant & Bar Area with Amazing Eats! An event for the entire Family! Children 12 and Under are Free. 1st Pick Friday is $10 and Sat, Sun $5. Free Re-Entry with any paid admission! Tickets Can Be Purchased at the Door! Shop at Jeans, Jackets & Jewels Benefiting Stray Rescue and Randy's Rescue Ranch! 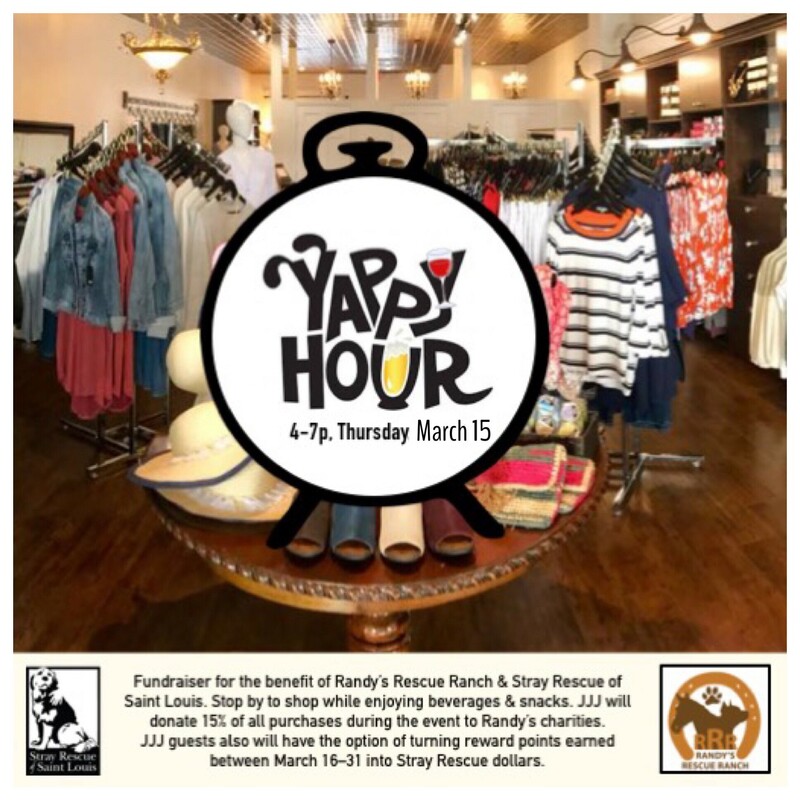 Visit Jeans, Jackets & Jewels for a fundraiser benefiting Randy's Rescue Ranch & Stray Rescue of St. Louis. Stop by to shop while enjoyng beverages and snacks. Jeans, Jackets & Jewels will donate 15% of all purchases during the event to Randy Grim's organizations. JJJ guests will also have the option of turning reward points earned between March 16th - 31st into Stray Rescue dollars. 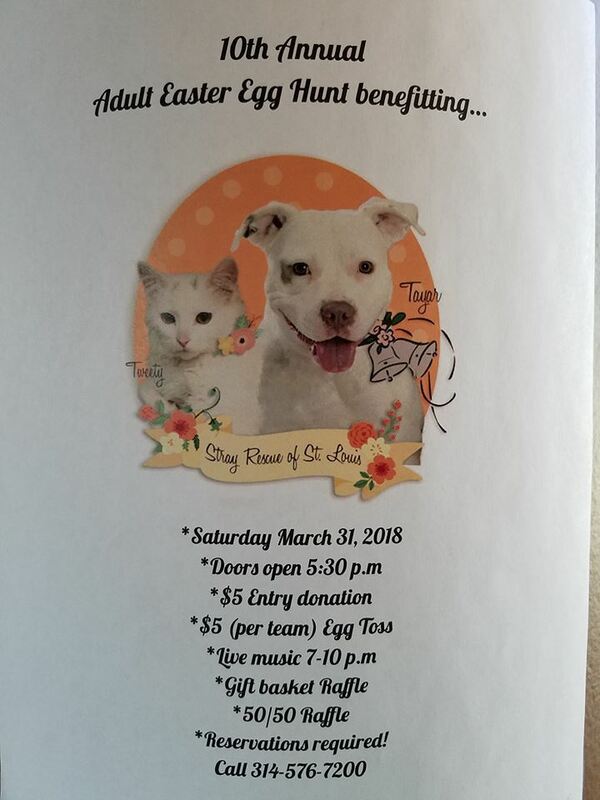 This exciting event will be the 2nd FUNDRAISING Trivia Night benefiting Stray Rescue, after the first one in March 2017 was so immensely successful. Questions will relate to Fantastic Beasts as well as the Wizarding World in general. 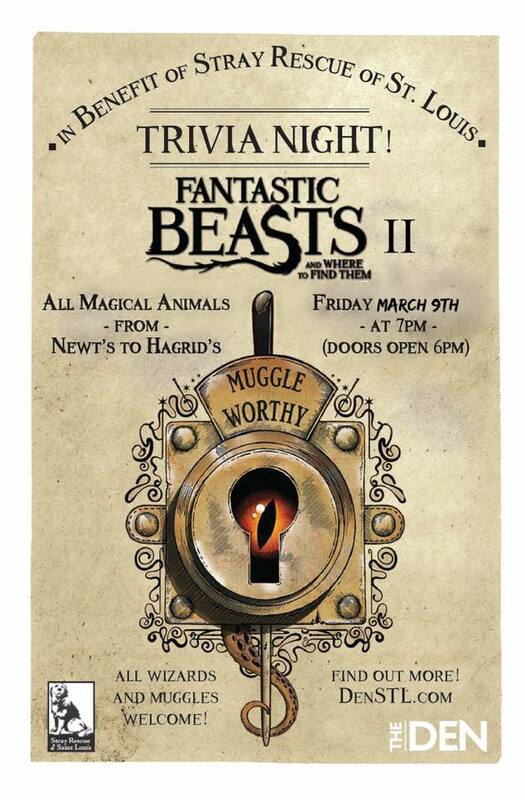 Be it Newt's or Hagrid's, Howarts or Ilvermorny, your knowledge will be tested. As before, participants are encouraged (but not required) to attend in their House Robes, or School Robes, or Quidditch Team Gear, or period clothing, or 'beast-wear'. Note, the trivia nights usually sell out long before the day of the event, so SIGN UP TODAY! THIS EVENT IS A FUNDRAISER FOR STRAY RESCUE. 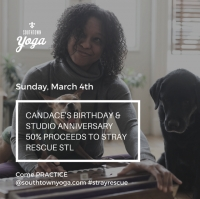 Southtown Yoga Studio Anniversary and Candace’s Birthday! The studio holds 55 mats. First-come First-serve! No preregistration. If you've never worked out at Southtown Yoga before, you'll need to fill out a new student form online on the website prior to class.